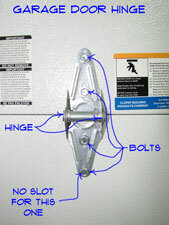 Lubricating garage door hinges is an important maintenance item for your garage door. The hinges are made up of metal plates that fasten to the garage door panels. They are joined together with a moving joint. Watch the garage door hinge when you lift the door. This is simple yet effective technology. Each hinge has two parts. Unfortunately, the metal that is used for these hinges is not high quality and prone to rust and corrosion. Lubricating them with oil on a regular basis will keep them from making noise and sticking. Do you see the spots that move when the door is operating? This is where they might start to stick, make noise or seize up. Multiply this by a dozen or so hinges and you begin to see why lubricating garage door hinges is important. The area of the hinge that needs oil is where the two sleeves rub against each other. It may take a little patience to work the oil into the affected areas. Use a can of silicone spray and lubricate the hinges. Keep a rag handy and don't over do it. Try using the garage door again and see if the hinge moves freely and quietly. No, try a little more lubricant. Yes, well done. Your door hinges are working again.